Monkton Nature Reserve, a 16 acre site set inside an abandoned chalk quarry on the Isle of Thanet in East Kent, has the distinction of being the first designated RIGS in Kent. The site, which is managed by the Thanet Countryside Trust, was designated primarily for its flora and fauna. Over 250 species of flowering plant including seven types of orchid can be found at the reserve. Twenty two species of butterfly and innumerable species of other insects, mammals and birds have been recorded at Monkton. The reserve is also home to the first artificial bat cave, or Hibernaculum, to be constructed in the UK. 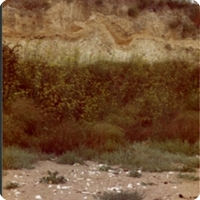 Geologically, the quarry cliffs, which are of Late Cretaceous age (Santonian), contain a reasonable number of good chalk fossils, a good visible section of one of the faults in the area, involutions and examples of Ice Age features incuding permafrost and a measurable trench into pure loess that can be sampled. Fossil collecting may only be carried out with supervision because the cliffs act as home to a number of bird species including a large colony of Jackdaws, a pair of Little Owls, and occasionally nesting Kestrels. Monkton Nature Reserve is open to the public from 11am to 4pm on Tuesdays, Wednesdays, Thursdays and Sundays.